Picture the scene. Its 24th April 2011, a sunny Sunday afternoon. Two people are on their way to a blind date. The man has only been separated from his wife for a year and is still a bit fragile. He’s not particularly looking for a relationship and is so unconcerned with making a big impression that he pops into every pub he walks past and is 3 pints deep by the time he arrives. The woman has been separated for two years and has dipped her toe into the piranha dating pool a couple of times with little success. Neither of them can really be bothered to go on the date but turn up solely to appease their mutual matchmaker friend who won’t ever let them live it down if they don’t go along. Three hours after meeting, they’re actually really enjoying the conversation and decide to grab some dinner. Six hours later they realise that its midnight and time really does fly when you’re having fun. Seven years later we are still together, happier than ever and planning a wedding. Celebrating our anniversary is so important to us both because we remember a meeting that we both approached with caution but which changed our lives forever. Each year, we treat ourselves to a luxury break away and have some time just for us which, as parents of 4 children is really important. This year we chose Manchester as we both really love the hustle, bustle, shopping and cocktails of a city. 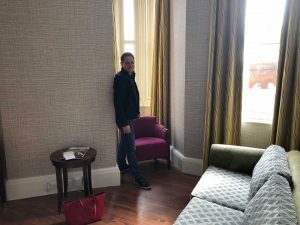 We decided to stay at The Midland Hotel because when it comes to luxury and the wow factor, few hotels beat it! The entrance hall is vast and really impressive and we were allocated a suite on the 5th floor. 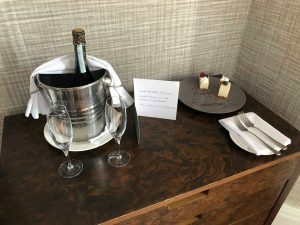 Greeting us when we walked in was a plate of cheese cake with a ‘Happy Anniversary’ decorated plate, a card and a bottle of prosecco! You don’t get that with the budget options and it really makes a difference to adding that special touch. 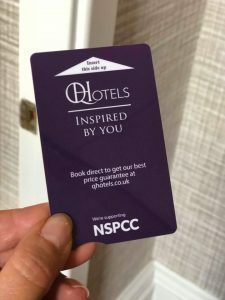 I was thrilled to see a berry tea on the tea tray as I can’t drink caffeine and am often left with just bottled water from the mini bar and I was also really impressed with the fact that the hotel key cards show that it supports the NSPCC. 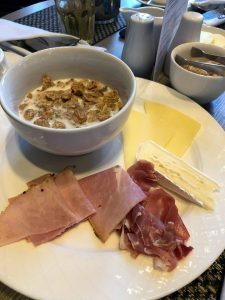 Its lovely to think that big hotels are giving something back to worthy causes and I don’t think I have seen that before when we have stayed in other cities. We hit the streets of Manchester for shopping and cocktails and then headed back to the hotel to get ready for our evening meal. 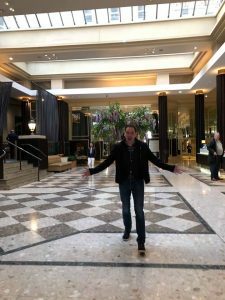 We dined at the beautiful restaurant which adjoins The Midland (but you can still visit if you’re not staying at the hotel). Mr Cooper’s is named after a house and famous garden that was around in 1819 which was owned by a Mr Cooper. The restaurants is now a modern bar and brassiere, which was awarded Bookatable ‘Best restaurant in Manchester 2018’. The food was just gorgeous (so delicious in fact that we ate it and then realised I hadn’t taken any photographs!!) We had pulled pork & apple croquettes and buttermilk tiger prawns followed by lamb rump and a sirloin steak which was all stunning and incredibly reasonable for such a high-end venue and followed it with a couple more cocktails. 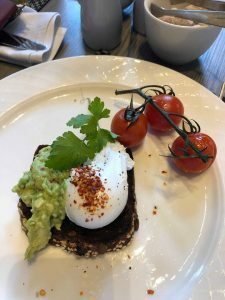 I have to say that the breakfast at Mr Coopers was absolutely gorgeous too! 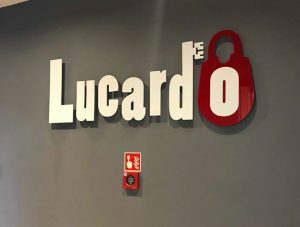 On the Sunday we visited Lucardo Escape rooms for our first experience of being captive super sleuths. The principle of escape rooms is that you get locked into a room and have a clue solving task to earn your escape. For us, we were put into the role of detectives who had an hour to find the identify and post code for the next victim of a ruthless serial killer. We were told that it was one of the harder challenges (typical that we would book that) but when we were struggling, extra hints and advice were flashed up on the tv screen inside the room with us. 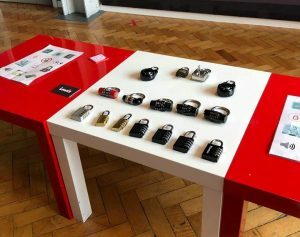 There were so many clues which provided us with number and letter codes which we needed to unlock a variety of pads locks. There were riddles to solve and puzzles to piece together. The screen showed the time counting down and even though we knew the scenario wasn’t real, solving the clues was exhilarating and we both felt the pressure as the hour drew to a close. We solved the mystery with just 29 seconds left on the clock and both squealed in victory to unlock the door! Without doubt it was one of the best things we have ever done and we are already planning a few return visits with different people. There are a variety of rooms with degrees of challenge and we are considering taking the children to one although its not advised for children under 12 and an adult over 18 has to go in with them. 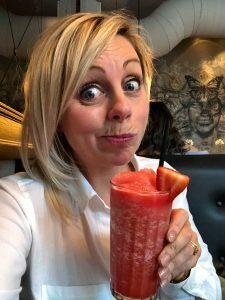 After our ‘release’ we headed to one of my favourite bars in Manchester, The Alchemist on New York Street. We sat reliving our fantastic victory over a seriously yummy lunch and some of the best cocktails in the city. The staff there are always incredibly helpful and very knowledgeable when it comes to advising you on the wide variety of cocktails and we went with the impressive light bulb moment, strawberry daiquiris and long island iced tea! The food is brilliant value as the portions are great and always taste delicious. We love the chilled, funky vibe in The Alchemist and as its so close to the shops it makes the perfect pit stop! 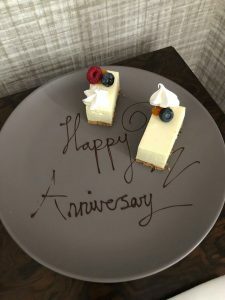 We headed home with full bellies and heavy hearts as the weekend came to an end but we are already counting down to next years anniversary celebrations – any ideas on where to go would be much appreciated! It all sounds amazing but I think it’s something you both thoroughly deserve and need. You are both pieces of a family jigsaw that gets pulled everywhere but eventually fits together nicely. I would take my friend ang who has been having a hard time lately and doesn’t know how long her mum has left. She is doing so well but is an only one and is finding it so hard and hurts so much. Thank you. I Would take my husband.We Haven’t actually had the pleasure of a break away since having out two sons so to win this would just be fabulous as it is well needed!! Hotel looks lovely! 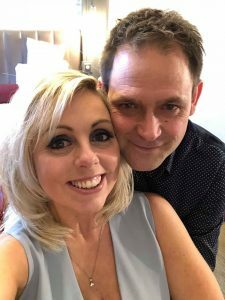 I reckon I should take my husband as it’s been a long time since we’ve been away together and so I think we’re overdue the chance to chat and have a laugh! This looks and sounds amazing, you look like you’ve had a great time! I would take my husband as we really need a break just the two of us. Not been away without the kids, since adopting three, three years ago! Jimmy and I have never been away just us two since we’ve been together! We’ve never stayed in a Hotel! We’ve also celebrated 7 years this year!! We are heading to Wembley in June to see Ed Sheeran, our first concert together! Wouldn’t it be lovely to win this and have another first this year! My best friend Carly, to visit our Manchester based other bestie. I’d take the husband. Prior to the kids appearing we used to regularly go pub quizzing. The escape rooms sounds perfect to get the ‘grey matter’ going again. I would take my husband of 44 years. We love a fun break. I’d take my wonderful other half as our 8 year anniversary is coming up! I would take my wife Jennie! Sounds great – love the Alchemist. Would take the Mrs because she deserves a break from our three kids sometimes! I would definitely take my husband. Lovely blog full of romance and fun, how lucky to find each other. You bring the Midland Hotel to life with the personal little details. It is so important to have special time together. What a treat this prize would be! I would take my husband Al Copeland! Sounds like a perfect weekend!! I’d take my other half. It’s our 10 year anniversary this year and we are finally planning a night away. Our first since having kids 5 years ago! I would take my husband. We have two young children and don’t have much chance to relax together! I would take my husband. We often go up to the outskirts of Manchester to look after my elderly mother, which is stressful and exhausting for both of us, and it would be brilliant to be able to escape for a little break while we are there. 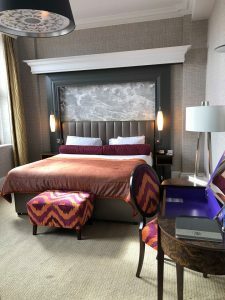 Never been to Manchester, hotel sounds amazing and there is plenty to do in the area.I would enjoy this with my husband. 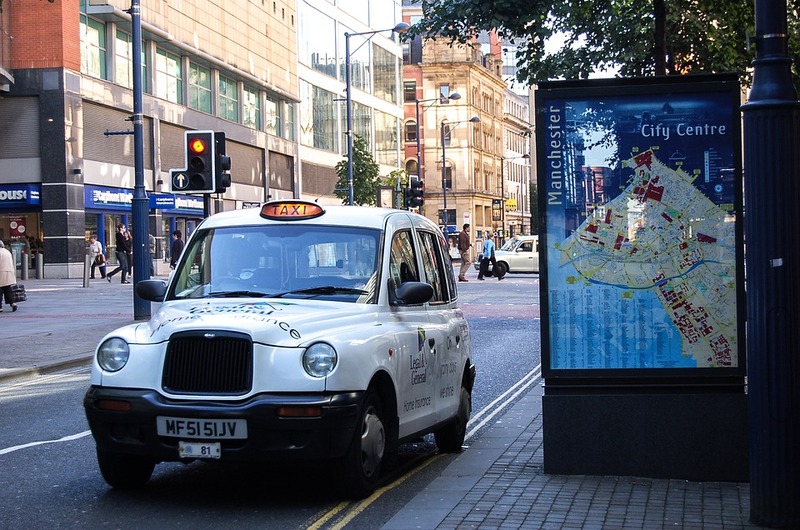 I would take my partner – many happy memories of Manchester from my days at the Art School! So many new things to see since those days in the 70s! Prize sounds amazing. I would take my hubby for our anniversary. Manchester is an amazing city. Would love to win this. I would take my Mum, sister or Nan. I would take a friend of mine who I know has been having a pretty rough year so far. I’d like to give her some breathing space to escape, where we can have a long-overdue catch up. Thanks for the chance! Oooh lovely! I would love the chance to treat my lovely husband! I’d take my other half. We love a night away. We keep talking about doing an escape room experience too, but haven’t got round to it yet. This would be perfect! I would like to take my husband for our 1st Wedding Anniversary! I would take my husband, Steve Goody, of 33 years for a lovely break and remind him of the Cheshire countryside that we met. I would take a blind date. Wow! I would love to win and take my wonderful husband Andrew. Together for 22 years it would be lovely to have a break together for just the two of us! I would take my partner to share a great weekend with. I’d take my girlfriend and do all the activities recommended! I would take my pregnant missus as she needs a change of scenery and a good spoil! My hubby and I don’t get much time together, just the two of us. So this would be the ideal competition to win. Brilliant prize. My husband Brian its our 21st wedding anniversary this year. I’d take my friend Joanne with me if I won. I’d take my best friend and husband of 18 years. He’s always so positive and has shown me what a fantastic dad really looks like. He deserves a surprise for putting up with me, especially over the last two stressful years of me doing postgrad study and setting up a business. He’s my rock. My not try too hard to escape the room though! I would take my husband of 26 years ! I would love to take my girlfriend Jessica. I’ve been studying hard for the past few months for my final university exams and shes been working all year. We’re also big fans of escape room games. I hope you had a great trip yourselves, you really deserve it! 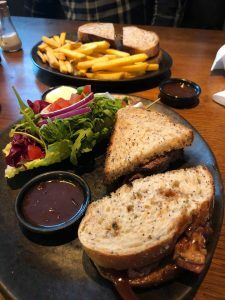 Manchester is one mine and my partners favourite places to go in the uk! It would be lovley not to have to stay in a budget hotel with lumpy beds! I would take my sister as hardley get to see her so would be good to have some girly time. Great competition. I’d love to bring my boyfriend Daniel. I guess it will have to be my husband! My lovely wife, sounds like a great getaway! I’d love to take my gorgeous fiance on a pre-wedding relaxation trip! I would take my partner, we’ haven’t had a break at all for over 2 years so this would be amazing! It looks so much fun. I’d take my mum with me! Escape rooms are so much fun, definitely one of my favourite activities to do when in a new city! I would take my lovely husband. We lead really busy lives so it would be great spend a bit of quality time with him. That trip really does sound like a dream! Me and my partner have a 5 month old baby, so have only ever been on one night away together. Loved every minute of it 😍 And would love the opportunity to take him there! Sounds fab – I’m jealous! We live so close to Manchester but haven’t enjoyed a night away there for years. My fiancé. It would be a wonderful treat for us both. Lovely post, looks like you had a great time! I would take my husband, Ian. 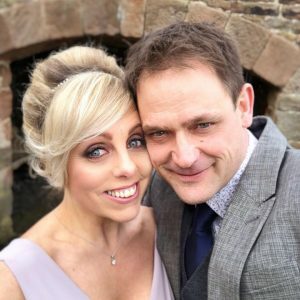 We are parents of 4 too and a little escape to Manchester would be amazing! Well I’d be in a lot of trouble if I didn’t take my husband! He’d love it. I’d take my partner for a well deserved break! This looks amazing!! I would take my husband. I’d take my wife of 27 years and we could celebrate the birth of our first granddaughter on the 20th December’17 .Now things have settled a little a break would be nice . i would take my husband to carry my bags! I’d take my wife – of course! I would love to take my wife Marie on this fabulous break. I can relate to alot of what you say about having your breaks together. We have been together nearly 29 years,and have six children. We were married 18 years ago. We have been to London/Essex,and Inverness together,but were staying with friends or family.. It wasn’t until 5 years ago that we managed to have some true time alone together..a country pub hotel,with meals included,and a lovely room with a 4 poster bed..we felt so special..it was 2 miles from home,but felt 1,000,000 away.We called it our honeymoon.We never had one when we got married. We were 20 miles from home,and some people scoff at our breaks,and question our choices.They mention abroad etc..
We don’t care..we have a great time,sharing the same sense of adventure,and excitement..enjoying places,and the sights and sounds of somewhere we have never been before,or rarely get the chance to go. What an amazing break you had – for an amazing couple who value the important things in life! I would take my hubby. We haven’t had a lot of time together this year as my Dad had emergency surgery in Jan and I’ve been doing the 330 mile round trip every week to help out and look after him. I’d take my partner Dave. What a fabulous prize to win – pure indulgence. I would take my partner (and best friend) with me. Wow it sounds like you had an amazing time. Life can be so hectic, its easy to lose sight of your relationship and take things for granted. Its important to make time for each other and a weekend away is the perfect way to celebrate your love. If I was lucky enough to win, I would take my husband. He’s my best friend, and has been my rock through what has been a challenging year to say the least. I would have to take my cause I have the most fun with him. My comment is missing the word husband! yet never get close enough to take it in my stride. but I’ve never wined and dined in town with that hubby of mine. It’s my Hubby Steve I’d take, yes darling it’s you….. I would take my mother just a as a thank you gift. I would take my friend, it would be great to treat her! I would love to take my mother along with me. I’d ask my daughter along for company. A lovely story.I would take my girlfriend,she has seen so little of this country outside London and she has a strong desire now to see as much of it as she can. I’d take my wife, and meet up with our niece who is at uni in Manchester. I would love to take my husband John for a romantic break away to celebrate his birthday in June. Looks like you had an amazing time! If I won I would take my husband Steve. This September is our 25th wedding anniversary so I know what it’s like to be lucky enough to have found your soul mate. Hope you have many more happy years together. 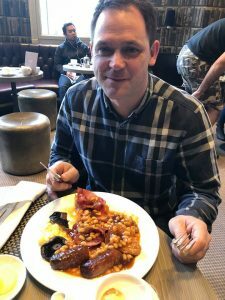 my lovely husband – hopefully we’d have a break as great as yours! This seems like an awesome city break, Charlie! I would love to win and I will take my travel buddy- Cez of Etramping. I’d share with my partner. I would take my husband for a lovely relaxing time away! I’d definitely take my husband, Jeff – with three busy boys it’s nice just to be us from time to time. I would take my friend Amanda. She has been very supportive over the last few months whilst I was going through a difficult time so it would be a lovely treat for both of us. My gorgeous husband. This year we are celebrating 15 years of marriage and 30 years of being together. With 4 kids and 1 grandchild – we need a break lol. Looks like you had a really fun and romantic weekend. Sometimes we forget to make time for us as we are so busy just getting on with day to day life. I would definitely take my husband as we always neglect date nights/ weekends away. And he definitely deserves to be treated. My partner would love to try out the Escape Room! I fancy the luxury night in the hotel and yummy lunch. Superb prize! I would take the Mrs.
Who will you take with you for this fantastic break ? I’d love to take my Hubby Peter – We need some quality time together and to celebrate my 51st Birthday. What a treat! I’d take my awesome husband (6 years married this summer). I would take my husband as its our 13th wedding anniversary in June. I think I’d take our eldest daughter for a girlie break to celebrate her finishing her masters. I miss her so much and she snores far less than my gorgeous hubby. Sounds magical! I’d definitely take my husband…. although my mum would make her case!! Wow! Looks fantastic – fingers crossed – good luck to everyone! I read your blog and shared it as it made me smile. I would take my husband Chris as he likes real ale and I like Gin and Tonic. My super husband! It’s our wedding anniversary next month but to be honest I don’t need my arm twisting for a break away! Looks fab! My husband to celebrate our 2nd wedding anniversary! Sarah Cooper, love a Manchester break, wonderful giveaway!!! Would love to treat my husband, would be a nice treat before I finish my maternity leave! I would take my boyfriend, been meaning to have a meal at the alchemist for a while! My daughter – she deserves a treat after working so hard away in France for last last six months. I would love to take my very best friend Eileen Atkin for a luxury city break in Manchester at the amazing Midland Hotel. Hmmm, in truth, I haven’t a clue right now as I’m newly separated. So, who knows? 6 months to decide at least, and wild horses wouldn’t stop me from a trip to the Midland, whatever happens! What a fab prize, so cool. I would take my lovely girlfriend, cat! wow, i would love to win this. I would love to enjoy this with my husband, for my birthday. I would love to spend some quality time with my husband. We have been together since we were 17 and it would be incredible to celebrate our 6th year of marriage and 16th together. We have both changed a lot but we are still very much in love and he still makes me cry with laughter. My Mum deserves more than I’ll can ever win or give her as she’s done so much for me. She is always on the go and never asks for anything in return. I would take my husband away for a bit of TLC! I’d take my best friend or send my lovely parents as a treat! This would be a treat, I would take my husband. I’d take my lovely husband, we need as many breaks as we can get!! I would take my hubby to give us a break from our 3 boys lol and a night of full sleep. Always wanted to try the Midland, would take my partner. I might take Peter. Or maybe my son can take his girlfriend. He used to live in Manchester and loves the place. I will take my lovely boyfriend with me as we have been so busy with uni these last few months, would be nice to celebrate getting through the year! Wow! What a fantastic prize! I would take my son. We are best friends and would have a great time together. I would love to take my mum on this wonderful break, she deserves it! I’d take my other half with me! I would take my husband, Keith. What a fabulous prize. I would love to go with my partner. I would love to take my partner and spoil him 😍 We have only had 2 nights out together since our daughter was born …. she is now 6!! So this would be perfect to spend time together as he would love the escape rooms. I would take my best friend, what a perfect excuse for a girly weekend away! i would love to treat my hubby whose birthday is July, it would be a nice finish to the school year too. I would take my hubby. 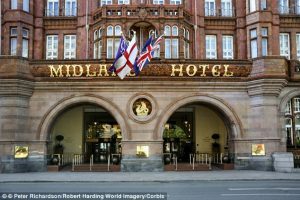 We LOVE Manchester, and have always wondered what the Midland Hotel was like! I would use this fantastic opportunity to go and see my daughter who has lived in Manchester since she went to uni there, so husband, get your coat, we’ve won. My husband who has been so supportive over the last year and a half, over and above! I would take my Husband on this break with me. Amazing prize by the way. I would have to take my number one! I would take my friend’s wife with me (and hope he doesn’t find out about it). I would take my partner. Thanks for the competition. I’d take my boyfriend as we met in Manchester. Sounds great. I would definitely take my partner Barbara. I’m not sure who I’d take yet, but I’d have a fab time! id take my lovely wife as it would be like a minimoon, we went to York when we got married and it never stopped raining. so this would be a huge treat for us. I would take my beautiful wife on this experience. It will be our anniversary very soon and it would be amazing to spend it in Manchester. I world take Manchester’s biggest fan, my husband, David. He lives Manchester United and the madchester music scene from the nineties! I’d probably take one of my teenagers. Hubby needs to babysit younger kids and dog. I would take my husband as we need to make time for each other especially as going through a really difficult time. I would take my sister. for some fun and laughter. congrats on your wedding anniversary ! My sister would love this and it would be good to spend some time together. We both have birthdays soon so what better way to celebrate. I’d love to take my boyfriend. He lived in Manc for 15 years and has lots of friends still there. I would take my partner Kim, he is a bloke but people think he is a girl if they haven’t met him! 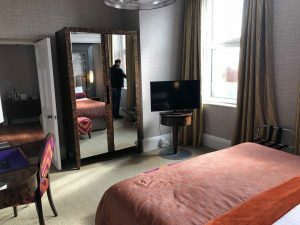 We would have a lovely relaxing romantic break, just chilling in an amazing hotel, eating good food and drinking fine wine and beer and enjoying everything Manchester has to offer! 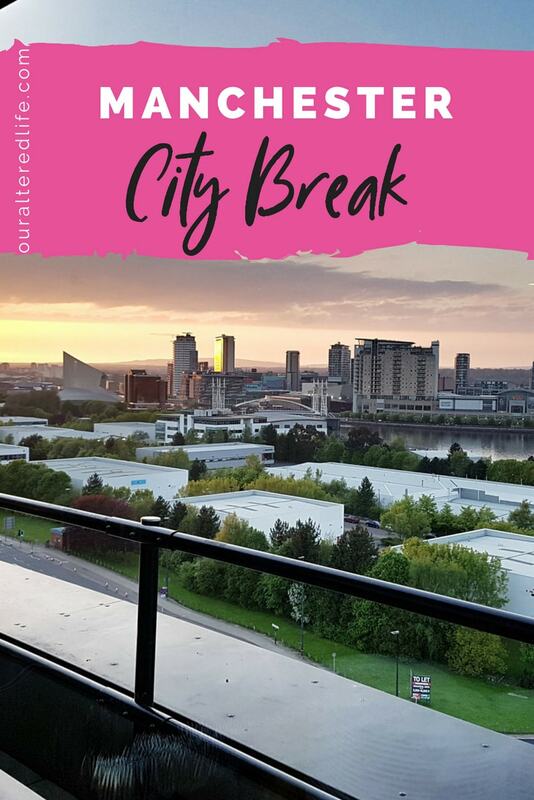 My husband of course, we love short breaks away and Manchester is always top of our city break list. 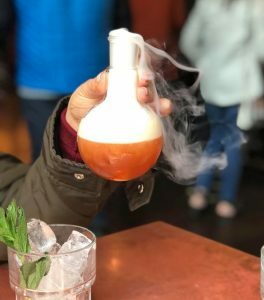 I love The Alchemist with their amazing cocktails. We are celebrating our 2nd wedding anniversary soon and this prize would be amazing to win. I would take my girlfriend Suzie. I would take my partner, Peter. His mum passed away in January and he has had so much to sort out he needs a break. We both love Manchester and saw the Midland Hotel in a documentary on television it looked amazing. Congratulations! How lovely. I’d take my husband of 35 years. Where does the time go?! I would take my lovely soul sister, Indira. She loves a bit of a challenge and this would be perfect for her. Manchester is one of my favourite cities would be thrilled to win fingers crossed! would take husband as he does so much for me. I’d take my best friend. We went to Manchester for the first time last year just after the awful bombing and we really enjoyed it, fell in love with the city! Looks absolutely AMAZING!!!! I’ve been to Manchester twice before but only passing through! Would love to stay a little longer! I would take my lovely Mum. My wonderful fiancée (because there’d be trouble if I didn’t). I would take my daughter we both love Manchester. The last and only time I have been to Manchester was for a football game – not my choice of activity! So would be great to go back with my husband Jay letting me decide the itinerary, the escape game sounds good fun! It sounds like you had a fab time! I would love to take my hubby, its been way too long since weve been away together! I’d love to take my mum 🙂 it’s been an awful 6 months and she very much deserves a break! I would take my hubby Phil, a great chance to have some quality time together! I would take my wife, who’s a former Manchester student. Be like old times! I would love to treat my husband because his birthday is coming up and he has been working really hard on our house renovation! I’d go with my husband. It sounds like such a fun experience! Love to try an escape room! I would take my partner songs could spend some quality time with his mum who lives in Manchester. Living and working in Nottingham he doesn’t get to see her very often. Would love to win this for him. It would be nice to treat my wife Sarah who has been suffering with depression and needs a break away. Our last holiday was our honeymoon 6 years ago. Currently saving for a holiday to Portugal but don’t think that’s going to happen until around 2020! I would take my soldier who needs a break from Royal duties, it is non stop! Fingers crossed! I would take my partner Lewis. He would love this amazing treat! I would take my boyfriend Joe. We’ve had hectic few weeks moving house so this would be a lovely relaxing break! I’d love to take my lovely wife to celebrate our wedding anniversary. I’d love to take the boyfriend for a special break away! My amazing husband. We’ve been together for 22 years and married for 15. He’s celebrating a very big birthday in August. I’d love to be able to treat him to a weekend away but we’re buying a house at the moment and should hopefully be moving in July, so I guess money will be tight for a while. I’d love to go there with my dearest bestest friend! To catch up and have a great laugh! i would love to treat my husband to a break away as we rarely get any time away from the kids. I’ve always wanted to visit and this place sounds amazing!!! I would take my sweetheart along with me! I’d like to take My fiancée. I would take my sister Isabell, we could do with a few days having fun. WOW! How lovely! I would really appreciate a much needed break with my husband Andrew! This would be perfect! You’ve been to New York Street, now it’s time for New York!